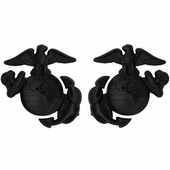 Our Regulation Full Size U.S. Marine Corps Insignia for the Enlisted Marine Corps Uniform Collar Badge is a black plated metal badge. Collar badges sold in pairs. This is the same badge that is supplied to the U.S. Marine Corps and sold in the Marine Corps Base Exchanges.